A few weeks ago we had a heat wave. 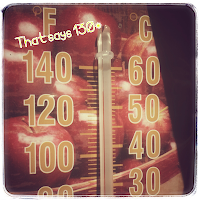 If you follow my instagram you may have seen this pic of the thermometer that is on my back porch. It gets full sun for a few hours in the afternoon. I think the official temp for that Saturday ended up being 111. 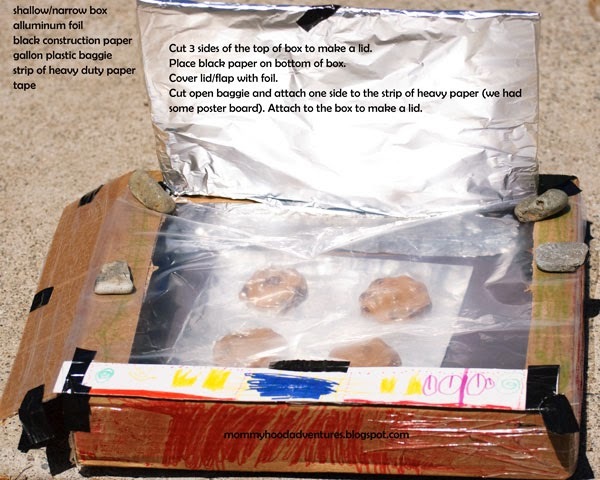 I decided each of the kids could make their own solar oven and each one could be designed differently. Then we would see which one worked the best. Each of the kids set to work making their solar ovens with my assistance only in the cutting of things like the foil pans. 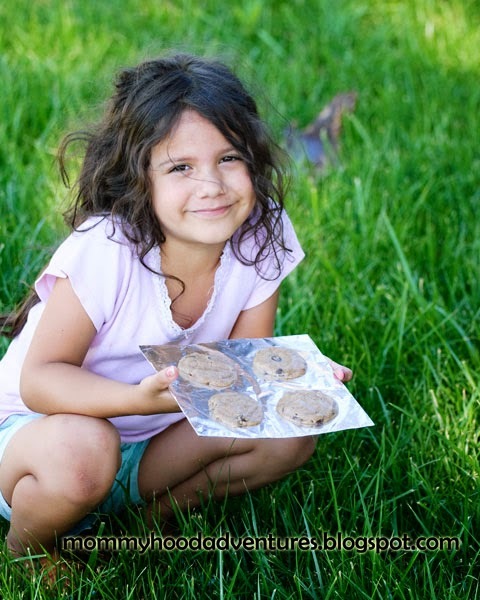 We loaded up the pans with the cookie dough and set them outside to see what would happen. Outside actually smelled like cookie near where we put the ovens. If outside smelled like cookies every time it was ludicrous hot, the heat might actually be worth it. Wouldn't you agree? The surprising result of our experiment was that all the solar ovens basically worked the same. I didn’t go out and buy anything. I actually had everything already so it was such an easy project. 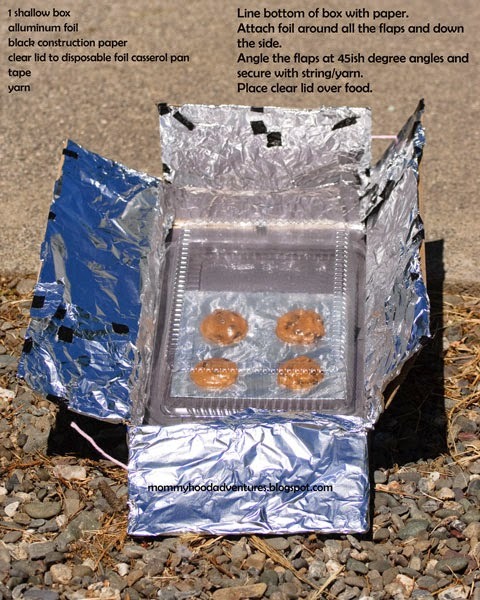 I had explored the internet looking at a bunch of ideas and some were very detailed and exact in how a solar oven is to be put together but then I found some that were less exact. What I noticed while watching the kids make their ovens, is that as long as the basic principles are kept, it really doesn’t matter. 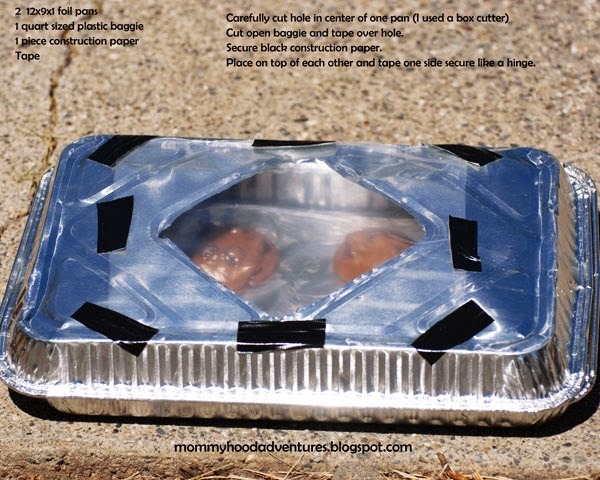 So the basic principles of a solar oven are that black absorbs heat and metal reflects light to help increase the heat. There are a few things I have decided we will do a bit differently next time. We will remember to use parchment paper under the cookies so they don't stick to our pans. I will be making new “pans” for the next time we make cookies or anything like cookies. I used aluminum foil covered poster board squares. Next time I will use black poster board with parchment paper taped to the top. This will help absorb more heat so the cookies will hopefully cook better. I will also try to get them out a little earlier. We ended up with shade a bit sooner than planned. We used this cookie recipe to make little cookies. Cookies will take about 2-3 hours to cook and you need to make sure you flatten the balls of dough a bit to ensure they cook in the center. 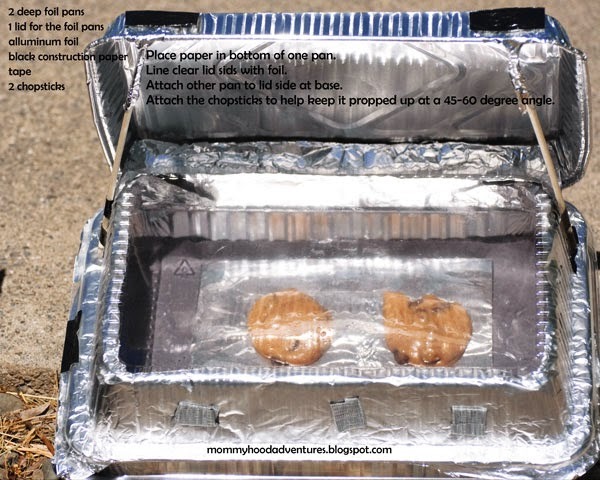 There are several websites devoted to solar cooking, look up what you want to try. 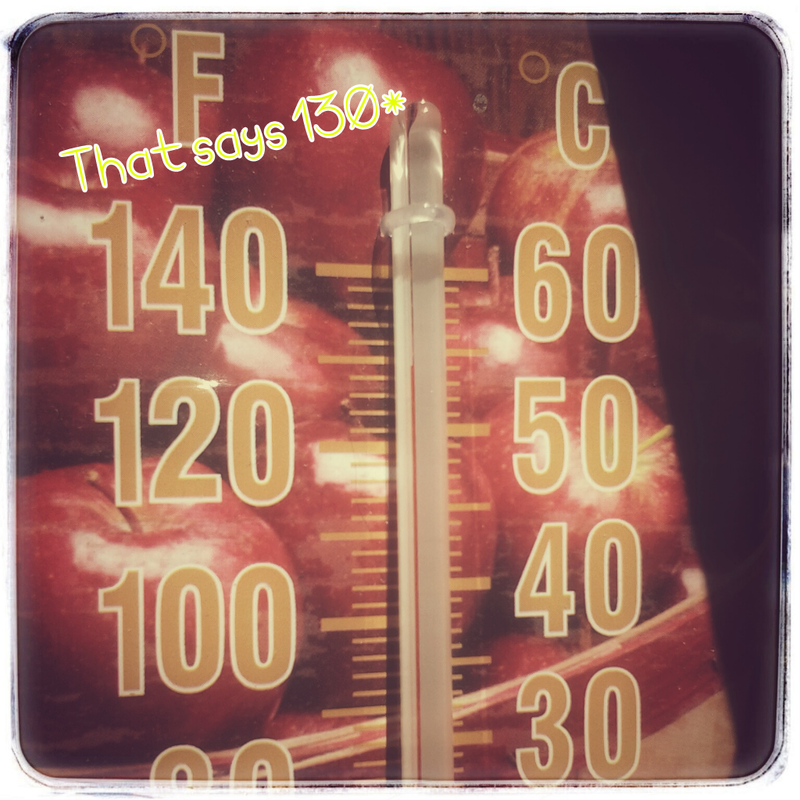 We will be using our ovens a lot this summer. The kids asked to make cookies again and I decided we could totally make lunch in them. And each time I am going to let the kids improve on their designs. I love that we are doing science while on summer break. In our house the learning never stops.